Paul says some stuff about his books. DANCING IN THE DARK is one of 10 finalist for the Georgia Author of the Year Award in the mystery category. The book is the first in the Max Maxwell series. The second book, SENTIMENTAL JOURNEY was released on 7 April. The biggest secret of World War Two may be about to be revealed…totally by accident. If the truth gets out, history may have to be re-written, counties may go to war, allies may become enemies and lives will be lost. One of them is Max Maxwell and he is not happy about it. He stumbled on the secret when his uncle, a WWII veteran dies and Max and his brother go through his belongings. From that day on the fuse is lit and there is enough explosives to destroy Max and everything he holds near and dear. He finds out what the United States government will do to keep a secret and how far it will go to destroy one who can reveal it. Johnny Morocco is hired to "babysit" a prize bull at the Southeastern Fair in 1953. He finds that this is not a simple chore, especially when he has to defend not only the bull but his own life the first night he is there. 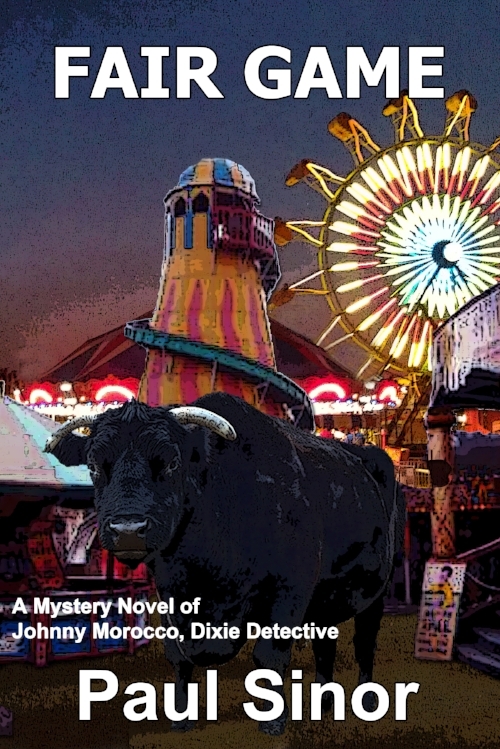 The dead man's three brothers and their preacher father are looking for Johnny, while he is looking for his runaway cousin who may be a dancer at the "girlie show" at the fair. Johnny finding a love interest then finding and losing his cousin and a shoot-out at a local restaurant, make the second book in this series a must read. When a diving buddy of Max Maxwell's is said to have drowned in a diving accident, Max decides to investigate the death on his own. His friend, a high school coach, is teaching some of the age appropriate senior girls more than they can learn in the classroom. What Max finds when he digs into his friend's background, shakes the small community north of Seattle, WA to the core. Dancing in the Dark, has been nominated for the 54th Georgia Author of the Year Award (GAYA) in the Detective/Mystery category. Max is recruited by an old Army buddy who is running an intelligence operation in Washington, D.C. He is drawn into an international web of smugglers who are on the verge of sneaking a dirty nuke into the Unites States or perhaps Canada. A Canadian operative working undercover as a nun, a love interest who is being stalked, and an American agent who was murdered in an elaborate poisoning scheme all keep Max on the edge until he can sort out all the pieces of the puzzle before everything explodes around him. Publishers Weekly Review: Army Career Officer Sinor achieves authenticity...that really succeeds. Congratulations! You've written a screenplay. Now what? Successful novelist, author, and produced screenwriter Paul Sinor shares his secrets to script sales success in this humorous and helpful book which gives you a peek inside the halls of Hollywood! Discover how to unlock the gates of the film biz from anywhere in the country. Learn practical, proven, easy to use tips and tricks for getting to the right people at the right time and know what to say when you get to them! Discover how to sell your script from Anywhere, USA.